New players in the gin game. An impromptu tasting event proves that there is a gin for every palate, as distillers bring new flavors to the table. I don’t like gin.” Ever say that? You might want to rethink your stance. There are so many new gins on the market, each with a signature style all its own, that saying you don’t like gin is akin to saying you don’t like fruit—the category is too vast. I have never, ever said I don’t like gin—except, perhaps, when it’s poured at 10 a.m. for the purpose of research. This is one of the hazards of my profession. Earlier this year, I was in my office answering e-mails (which sometimes seems like my profession; it does not pay well) when there came a knock at my door. Pete Buttiglierri, a partner with his brother Sal in Painter’s, the wonderful Hudson Valley inn that I’m happy to call my local, was stopping by to pay a visit. He was brandishing a bottle of gin and two glasses. Having an office that’s a stone’s throw from your favorite bar can be dangerous. This was the fifth bottle of gin that Pete had brought by in the past week. He buys new bottlings of just about any spirit as soon as it comes on the market—the spirits list at Painter’s is second to none. Pete is a liquor salesperson’s dream, but on that Tuesday morning he was fast becoming my nightmare. Enough with tasting gin straight up. I had to think fast. “Pete,” I said, “I have an idea.” To compare gins side-by-side, and at a time of day that a reasonable person can handle, I was thinking Aviation cocktails. Flights of Aviations, in fact. The Aviation is a doozy of a drink. It was first immortalized in print in Recipes for Mixed Drinks, a 1916 book by Hugo Ensslin, a New York bartender. And the Aviation is also one of the very few gin-based cocktails that Mardee, my wife, adores—providing it’s made with Aviation, a new gin on the market. The juniper in Aviation gives the gin a sturdy backbone, but there’s also a lovely lavender note in this bottling, and that’s what makes it perfect for Mardee’s cocktail. So, I thought, we have a bunch of new gins that Pete just procured, we have a classic cocktail, and we have the Gallery Bar at Painter’s, a small private room complete with a 12-seater stretch of mahogany that I like to get behind on occasion. “Wanna hold an evening of Aviations at Painter’s, Pete?” Pete’s easy. He went for it. Ensslin’s recipe calls for a couple of dashes of crème de violette, but the version that’s commonly accepted these days calls for just gin, maraschino liqueur and fresh lemon juice. The maraschino—a nutty, spicy liqueur as opposed to the more familiar, overly sweet maraschino- cherry flavor you might be thinking of—serves to point up the qualities of the gin. The lemon juice acts as a balancing agent. The plan was to serve flights of three mini-Aviations, each one made with a different gin. We called on two top-notch bartenders to help out, and we hired a couple of tacky stretch limos to bring a few people up from the city. Ten percent of the tip cup would be donated to a local hospice, and Pete and Sal agreed to not only match the tip cup donation, they’d also throw 30 percent of the gross in the pot, too. Charlotte Voisey is a prize-winning ex-London bartender who now serves as brand champion for Hendrick’s, the beautiful Scottish gin with flavors of cucumbers and rose petals underneath a wonderful blanket of juniper. She agreed to jump behind the stick for this worthy cause. Simon Ford, another ex-London bartender of great renown and the brand ambassador for the deservedly acclaimed and highly intricate Plymouth gin, donated his services, too. They joined me and Martha Schueneman, who tends the Gallery Bar at Painter’s on Wednesday nights, for an evening of organized chaos. It was a night to remember. Gin is nothing more, and nothing less, than flavored vodka. And as is the case with flavored vodkas, the best of the bunch are made using fresh, or dried, botanical ingredients that are distilled into an otherwise neutral spirit. Angelica, calamus root, caraway, cardamom, cassia, cinnamon and fennel are botanicals familiar to gin distillers. They also look to lemon zest, orange zest and sometimes even grapefruit to introduce fruity notes to their elixirs. Juniper, of course, is mandatory. In addition to Hendrick’s and Plymouth, all the finest old-school gins were poured at Painter’s that night. 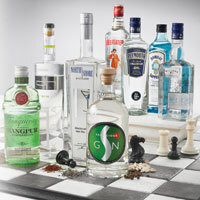 Beefeater, Boodles and Tanqueray, the no-nonsense leaders of the pack, stood tall behind the bar. Bombay Sapphire, a tad softer on the palate, helped complete the display of classic gins. They were far from the only gins on hand, though. The beautiful Old Raj, another product of Bonny Scotland, made an appearance; it’s the only gin, as far as I know, that calls for saffron in its list of botanicals. And the saffron shines right on through. But it was also a night for some of the newer gins on the market to shake their botanicals. These included the aforementioned lavender-scented Aviation, which you may be surprised to learn is made in Oregon—and it’s not the only quality gin made on the west coast. Junipero and Gin 209 both hail from San Francisco and both fall into the straightforward, complex, traditional, juniper-perfumed gin category. Sarticious, on the other hand—the name apparently denotes “passion and creativity”—is unusual. This offering from Santa Cruz is very herbaceous, using cilantro as one of its flavoring botanicals. California isn’t the only part of the world that’s getting in on the gin act. France is at it, too, and their offerings are all about depth, flavor and balance. Citadelle has been around for a few years, and it boasts beautiful, perfumed, floral complexity. G’Vine, another offering from France, is very new on the market, and this one is a gin unto itself. G’Vine uses green grape flowers as a flavoring agent among other botanicals, adding a dimension previously unheard of in the world of gin. Tanqueray has had tremendous success with its No. TEN—a kinder, gentler gin. Now, Tanqueray Rangpur is being introduced; it’s a lime-scented rendition of the quintessential British spirit. Other new, or new-ish gins on the market include Broker’s and Martin Miller’s, both sturdy traditional gins; Bulldog, a softer rendition of the spirit; DH Krahn, a gin for lovers of coriander; Bluecoat and Distiller’s Gin No. 6, made in Pennsylvania and Illinois respectively, both available in limited markets, both thoughtfully made, and perfect for martini lovers. Juniper Green is the only organic gin that I know of. The revelers who attended our Flights of Aviation night at Painter’s were a mixed bunch—from gin lovers to gin haters (this latter dragged to the event by the former, for the most part) and everything in between. How did the gins fare? The Aviations we made with the more stout-hearted and bold gins—Beefeater, Tanqueray, Plymouth, et al—suited only confirmed gin lovers. They rose to the occasion and, although they didn’t decimate the maraschino liqueur, they certainly made their presence known. The gins with a character all their very own such as Hendrick’s, G’Vine, Aviation and Sarticious, put their own mark on the Aviation Cocktail. The drinks stood out from the crowd and they suited a variety of people. We found that when we were using softer gins—Tanqueray No. TEN springs to mind—a little more gin, and a little less maraschino worked best if we wanted the character of the gin to shine through. Overall, it was a smashing success. We raised a few hundred bucks for the hospice, and, I kid you not, we had a 100-percent conversion rate among the gin haters: Not one of them went home without admitting that they’d finally found a gin that they liked. Fill a cocktail shaker two-thirds full of ice and add the ingredients. Shake for approximately 15 seconds and strain into a chilled cocktail glass. Adapted from a recipe by Jeffrey Morgenthaler, Head Bartender, El Vaquero, Eugene, Oregon. Fill a cocktail shaker two-thirds full of ice and add the ingredients. Shake for approximately 15 seconds and strain into a chilled cocktail glass. Adapted from a recipe by Timothy Lacey, Beverage Director, Custom House, Spring, Green Zebra, Chicago. Fill a cocktail shaker two-thirds full of ice and add the ingredients. Shake for approximately 15 seconds, strain into a chilled cocktail glass, and add the garnish. Adapted from a recipe by John Hulihan, Bartender, Lark Creek Steak, San Francisco. Fill a cocktail shaker two-thirds full of ice and add the ingredients. Shake for approximately 15 seconds, strain into a chilled highball glass, and add the garnish. Adapted from a recipe by Steve Izzo, Beverage Manager, One Market Restaurant, San Francisco. Adapted from a recipe by David Myers, Bartender, Sona Restaurant, Los Angeles. Adapted from a recipe by Junior Merino, The Liquid Chef, New York. Fill a cocktail shaker two-thirds full of ice and add the agave nectar, blood orange purée, pineapple juice, tarragon and gin. Shake for approximately 15 seconds, strain into a chilled cocktail glass, and top off with Champagne.